Use this fun and easy recipe to create a simple treat that your whole family can make and enjoy together. In a large pan, melt the butter and marshmallows. Add in the rice cereal and shredded coconut and stir to combine. 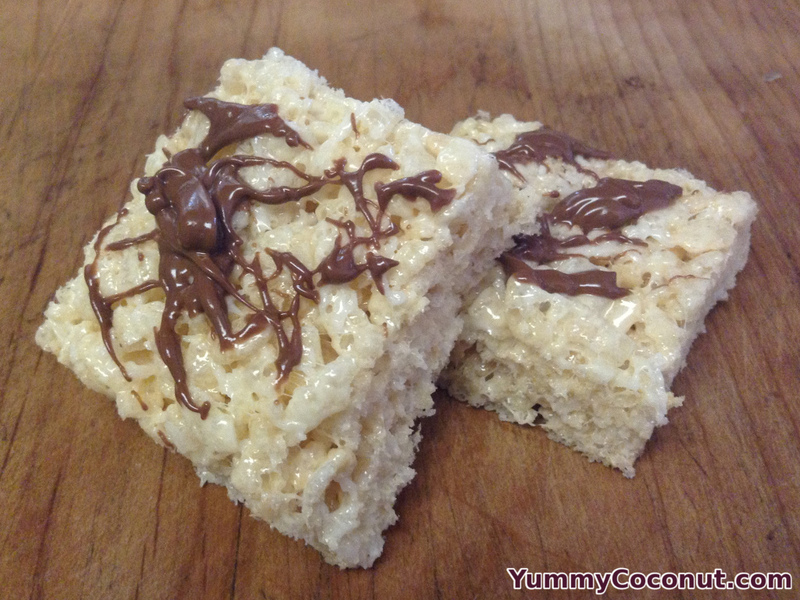 Pour the cereal treats onto a large sheet pan and spread out the mixture into an even layer. Let the cereal treats cool. Once cooled, slice into squares and set aside. In a double boiler, melt the chocolate chips with the butter. Dip the bottom of the treats in the chocolate or use a fork to swirl the chocolate onto the tops of the treats. Place the treats in the refrigerator to set the chocolate then enjoy! Smaller marshmallows melt more quickly and consistently than the large marshmallows. The treats are super sticky, it helps to wet your hands or a spatula to keep them from sticking to the treats when you go to smooth them out. Wait until they are completely cooled to cut them, this will ensure that the treats hold their form better.